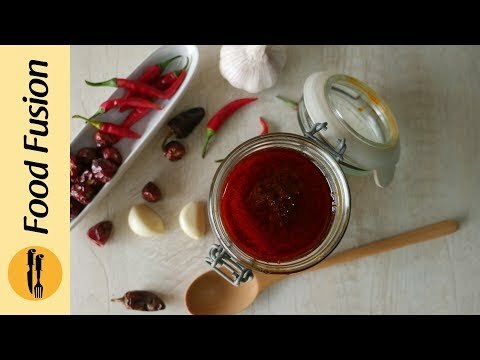 Recipe in English: Ingredients: Secret Red Chili Paste: -Lehsan (Garlic) cloves 125 gms -Lal mirch powder (Red chili powder) ½ Cup -Tomato ketchup 4 tbs -Safed mirch powder (White pepper powder) 1 pinch -Namak (Salt) 1 pinch -Pani (Water) ½ Cup or as required -Oil 1 Cup Directions: For Secret Red Chili Paste: -In chopper,add garlic,chop well & set aside. -In bowl,add red chili powder,tomato ketchup,white pepper powder,salt and water,mix well & set aside. -In wok,add oil,chopped garlic and fry until golden brown. -Now add prepared red chili paste,mix well and cook until oil separates (3-4 minutes) & set aside. -Can be store in air tight container for up to 1 month on shelf. At a closed meeting at the Hilton Hotel in midtown Manhattan, Bill Deblasio, the newly elected Mayor of New York City, met with the American Israeli Political Action Committee. Despite the efforts to keep the meeting secret, the words Deblasio spoke to the Zionist gathering were leaked to the press. An audio recording captures the Mayor of New York City saying: \"Part of my job description is to be a defender of Israel.\" Lamis Deek, a human rights attorney in New York City, says that it is interesting that Deblasio worked so hard to conceal his meeting with this powerful Zionist organization. While Deblasio proclaimed his loyalty to Israel, he did not speak for all New Yorkers. A growing number of people in New York City are highly critical of Israel and its crimes. The fact that the Mayor of New York City would openly proclaim his loyalty to Israel is seen by many as an indication of the power Zionists have over US foreign policy. The fact that it was done in secret also causes many to be suspicious. PressTV Presents - The CIA's Secret War in Pakistan - English, A Short Documentary on the Extra Judicial Killings of Innocent Pakistani civilians. Secret Esoteric Dimensions of Wudhu (Ritual Ablution) | REFLECT Wudhu is a washing process that Muslims perform 5 times a day and it is compulsory to be in the state of wudhu before touching the holy texts or praying. But how often do we contemplate over the hidden, mystical meaning behind the action of Wudhu? Islamic Pulse’s new show, hosted by Shaykh Farukh Sekaleshfar, explores the hidden, esoteric dimensions of the Wudhu. It is a great misconception to assume that the rituals prescribed by Islam are merely physical, but rather, for every outer action, there is an inner, deeper reality. Inshallah, this will be the first of many shows exploring the often neglected hidden realities according to the mystics (urafa) and gnostics, grounded firmly in the Quran and Ahadith. This is another video from National geographic showing how agents train for stamina, agility, and agent-stuff. It would be cool if there were Muslim training clubs too! Loopy takes a tumble while skiing, but what really hurt her was Pororo calling her a “slowpoke.” Pororo realizes that he was wrong and feels bad about teasing her. He does everything he can to make her feel better including giving her a gift and even singing her a song, but nothing seems to work. Petty suggests that Pororo should try being a “secret friend” to Loopy. This means helping Loopy anonymously. Can Pororo reconcile with Loopy by becoming her secret friend?